TEMPE – With only a few months left until the Super Bowl in Glendale, Diane Radeke wants her Native American jewelry store in Scottsdale, Old Town Jewels, to maximize the opportunity by helping visitors find her store online. Technology companies GoDaddy, PayPal and Yelp want her to build her online presence too, so the three have teamed to create a series of workshops to teach Radeke and others how their small businesses can thrive during the Super Bowl and the months leading up to it. Get Big Game Day Ready is a series of workshops that providing advice on how using each of the companies’ services can prepare them for the 90,000 visitors expected for game day. On Thursday, 300 people attended the series’ opening event at GoDaddy’s Tempe location. Rick Marvin, PayPal software engineer and an organizer of the event, said that businesses have a great opportunity to attract customers because when tourists come to town they’ll likely go online to find places to visit. The event started with a panel discussion with audience-submitted questions featuring Chris Rising, director of small business growth at PayPal, Phil Bienert, executive vice president of commerce at GoDaddy, and Erica Galos Alioto, executive vice president of local sales at Yelp. Panelists noted that businesses like hotels and restaurants will of course will benefit, but all types of industries can profit from the game’s large influx of people. They emphasized the importance of a small business being prepared by having a plan and knowing how to execute it. Alioto explained that small businesses can compete with bigger establishments by simply sticking to providing great service. The panel was followed by three separate presentations from each of the tech companies elaborating on mobile commerce and how to enhance business profiles online. 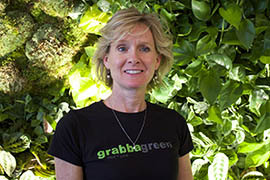 Kelley Bird, co-owner of Grabbagreen restaurants, said she’s hoping that Super Bowl visitors will help spread the word about her establishments beyond the Valley. With two locations in Scottsdale and another opening soon in Phoenix, she said her company is in the midst of franchising. Kelley Bird, co-owner of Grabbagreen restaurants, attended the Get Big Game Day Ready seminar to learn how to enhance her company's online presence for Super Bowl visitors.